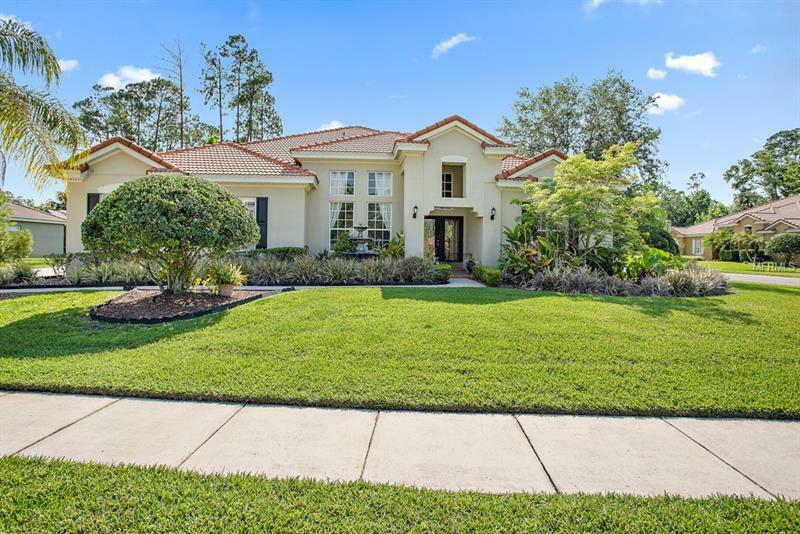 GATED MAGNOLIA PLANTATION 4 BR 3 BA POOL HOME WITH OFFICE AND FENCED CORNER LOT - Welcome home to this sought-after family-friendly community offering a 24/7 manned guard station tennis courts and tranquil streets for family bike rides. Located near the Wekiva River Basin Conservation Area making it a nature loverâs paradise. Situated in a quiet cul-de-sac this 2741 SF home has a Spanish tile roof .48 acre corner lot with lush lawn Palm trees and wrought-iron fenced back yard with screened lanai and sparkling pool! Inside is a split plan with high ceilings crown molding Plantation shutters art niches tile carpet and wood laminate. Spacious living room with double French doors to pool. Elegant dining room has soaring ceilings and windows. Kitchen with Cherry cabinetry granite counters prep-island breakfast bar stainless appliances double ovens walk-in pantry closet pantry wine bar and dining alcove. Family room with wood burning fireplace flanked by built-ins plus surround sound speakers and pool views/access. Master suite has tray ceilings pool access and private en-suite with 2 walk-in closets 2 sinks tiled shower garden tub and linen closet. Master bath connects to private home office which could be 5th BR. Inside laundry room and 3-car side-entry garage with storage. Relax or entertain on the covered screened lanai complete with Bose speakers solar heated pool gas spa and Summer kitchen with stainless Kalamazoo gourmet grill 2 burners and refrigerator. A Must-See!